Percutaneous nephrolithotomy (PCNL) is the standard of care for large renal calculi which are no longer suitable for extracorporeal shockwave lithotripsy. The key to success depends on the urologist’s choice of instruments, preoperative and intraoperative access planning, patience, perseverance, skill and training. Percutaneous renal access is a crucial early step that may ultimately influence outcomes of PCNL in terms of overall stone-free rate and complications. 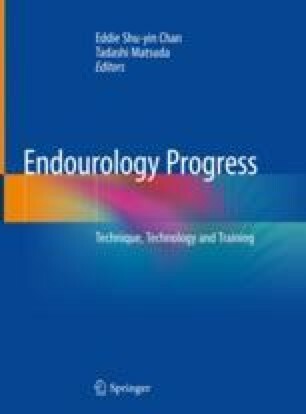 Several techniques for access and tract dilatation are described in this chapter. Prone, supine or lateral positioning during renal access have inherent advantages and disadvantages. Similarly, various adjunct imaging modalities and instrumentation are available to increase success and decrease the risk of complications. Nonetheless, the most practical and effective approach still depends heavily on stone burden and renal anatomy, available instrumentation and equipment, and the surgeon’s expertise and level of training.